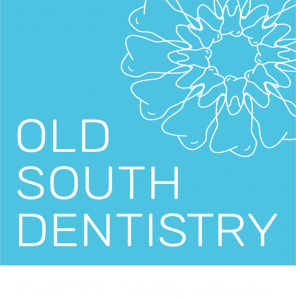 At Old South Dentistry, we begin with a comprehensive examination of your teeth and gums. The examination will include low radiation digital x-rays to detect cavities between the teeth, oral cancer screening, and a periodontal examination to assess the health of your gums. 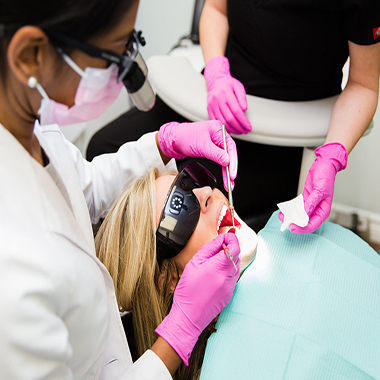 The cleaning is performed with hand instruments and an ultrasonic scaler to gently break up plaque and tartar that build up below the gum line. If you have sensitive teeth, our hygienists can discuss options to make your cleaning more comfortable, such as local anesthetics or needle free anesthetic gels. Our team will show you how to perfect your home care in between visits so that future cleanings will be effortless and easy. and shape of roots, as well as the presence of infections. disease, may require them more frequently. Association guidelines to minimize exposure to our patients and our operators. If you are not sure why a particular x-ray is being taken, please feel free to ask us! your dentist to ensure that small problems don’t develop into bigger ones. Oral cancer is the 13th most common cancer diagnosed each year in Canada. It can develop in any part of the mouth, including on the lips, tongue, cheeks, floor of the mouth, roof of the mouth, sinuses and throat. Like any kind of cancer, oral cancer can be life threatening if not diagnosed and treated early. Oral cancer screening is part of our routine dental examination, where we will check for lumps or irregular tissue changes in your neck, head, face, and inside your mouth. A filling is a way to restore a tooth damaged by decay(cavity) back to its normal function and shape. When we place a filling, we carefully remove the decayed area of the tooth, and then fill the cleaned out cavity with a durable dental composite material. If you’re like most patients, you may choose white composite fillings instead of silver fillings, because of their improved aesthetics. Crowns are full-coverage restorations that are used to protect a tooth that is cracked, or heavily restored, from fracture. Crowns fit over the original tooth, can be made out of porcelain or metal, and have the appearance of a real tooth, so that only you know that it is in place. Dental crowns can also whiten, reshape and realign existing teeth, adding to a healthy and vibrant smile. A bridge, also called a “fixed bridge” or a “fixed dental prosthesis,” is a dental restoration that replaces one or more missing teeth. It extends across an area that has no teeth and is typically made up of an artificial tooth fused between 2 crowns. The bridge is held firmly in place by your own teeth or by dental implants. Dental implants are titanium posts that are surgically positioned into the jawbone beneath your gums to provide stable support for artificial teeth.. Once put into place, these implants enable the dentist to attach a crown, denture, or bridge to them. They are designed to be long lasting and, with proper care, can last for many years. They are not your teeth but can function just like them. A root canal therapy is usually recommended when the tooth surface is healthy, but its root or pulp is inflamed or infected. Common symptoms are: acute and intense pain, sharp pain when biting down, lingering pain after eating hot or cold foods or dull ache and pressure. During a root canal therapy, the pulp of your tooth, which consists of nerves and blood vessels, is completely removed and the ‘canal’ is cleaned out, filled and sealed again to preserve the inner and the outer structure of the tooth and prevent any infection from recurring. A tooth may need to be extracted for various reasons: severe decay, fracture beyond repair or gum disease. Occasionally, an extraction may be required if there is not sufficient space in the jaw, or prior to orthodontic treatment. Since the removal of a tooth can cause aesthetic and functional problems, such as teeth shifting and inability to chew, our team will give you alternatives to extraction and options to replace an extracted tooth. The Canadian Dental Association and The Ontario Dental Association recommends that a child’s first visit to the dental office should be within 6 months of the eruption of their first tooth or by their 1st birthday. Lifelong health begins early, so our team at Old South Dentistry will help your little ones develop and maintain healthy oral habits from the start. We strive to make your child’s every appointment comfortable and fun so they can keep a positive attitude towards their dental visits. We will help your family establish healthy oral hygiene and dietary habits to grow cavity free. Dentures are replacements for missing teeth that can be taken out and put back in your mouth. Today’s dentures are made more natural looking and comfortable than ever. There are two types of dentures; full and partial. Dentures are custom made in a dental laboratory after impressions are taken of your mouth. Our dentists will discuss options with you and help determine what type of denture is best for you. Teeth grinding can disrupt a good night’s sleep, cause jaw pain and extensive enamel loss. Night guards are bite pads that are supposed to be worn at night as you sleep, and will keep your upper teeth from grinding against the lower teeth, preventing tooth wear and protecting your jaw muscles. They are fabricated with high-grade acrylic and our team will custom fit them to your teeth. A sportguard/mouthguard is an important piece of athletic equipment for anyone participating in a sport that involves falls, body contact or flying equipment, and can result in an injury to the mouth. This includes football, basketball, baseball, hockey, skateboarding, gymnastics, mountain biking. Mouth guards create a cushion that provides potential stabilization of the jaw, and reduce injury to your teeth and soft tissues surrounding it. Our customized mouthguards provide the best fit, protection and comfort and are more durable than store-bought ones. Whitening is a safe, effective, and efficient way to dramatically improve the overall appearance of dull or yellowish teeth. We offer a custom made whitening system to help you brighten your smile again.